Labrador is part of the province of Newfoundland and Labrador (NL) on the east coast of Canada. Bordering the Atlantic Ocean, Labrador is home to the Inuit, Innu and Métis Aboriginal peoples. The Aboriginal have occupied the northern and coastal region of the province for centuries. Like many other Aboriginal groups in Canada, the Labrador Inuit choose to participate in the comprehensive land claim process in the 1970’s. These land claims would create a self-governing region within Labrador appointed to the Inuit. Presiding over this area, they would be able to create their own governmental departments and have power over things like health and education, while still operating within Canadian laws. In 2005, The Labrador Inuit Land Claims Agreement (LILCN) was signed by the Labrador Inuit, the Government of Canada and the Government of Newfoundland and Labrador. This created Nunatsiavut. The region is approximately 15,800 square kilometers. 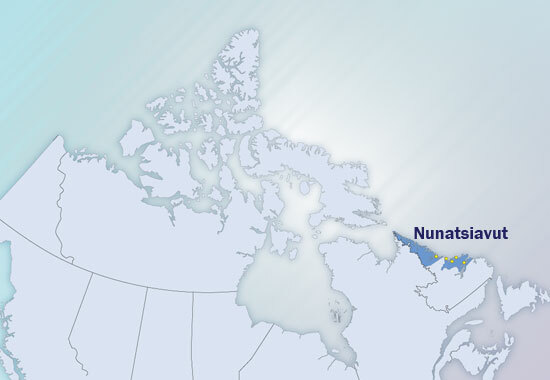 Map showing where Nunatsiavut is located. This page looks at the education system for Nunatsiavut children and students. While the system has struggled for decades, even since the Land Claims in 2005 things have not improved as much as expected. I will look at the changes since 2005 and how historical challenges continue to be faced today. Christopher Alcantara, “Explaining Aboriginal Treaty Negotiation Outcomes in Canada: The Cases of the Inuit and the Innu in Labrador.” Canadian Journal of Political Science 40 (2007) 185-207.